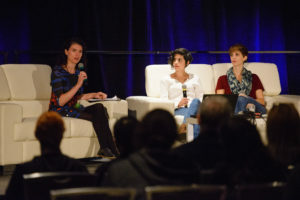 From left to right: Terra Clarke Olsen, Ashly Burch, and Sarah Elmaleh. Photo by Danny Ngan. Ashly wanted to be a singer when she was young, scoring a role in Music Man when she was just in grade school. Singing really pushed her to acting, but wasn’t quite on par with another passion of hers: video games. Ashly had always been a gamer, as was her brother. Her interest in acting first met her interest in video games when she was only eleven years old, still in middle school. This was when she picked up Metal Gear Solid. She hadn’t played anything quite like it before. Kojima’s work was edgy, totally different from anything else she’d played at the time, and that’s what made her want to get involved. Similarly, Sarah started off in theater. She wanted to be a dancer, but that dream was put on the back burner when she was injured in Once Upon A Mattress. It wasn’t until college that she started voice acting. She got involved in amateaur radio and worked on the college’s radio station, where one of her first big projects was putting on a reenactment of The Curse of Monkey Island. It was then that she got really into acting “audio only,” as it required a whole new level of depth that differed from stage acting. Moderator Terra Clarke Olsen. Photo by Danny Ngan. Ashly started off on YouTube with her brother. Both are known for the popular series, Hey Ash. Anthony, Ashly’s brother, was a Features Editor at Destructoid at the time. He wanted to make an indie games documentary, and didn’t know how to use a camera – that’s where Ashly came in. Youtube was still a new platform at the time. They started making making videos for fun, and the rest is history. “I don’t bristle much,” Ashly said on her success with Hey Ash. It was a gateway to future opportunities, to which she is grateful, as it served as a big stepping stone that helped her find great connections and develop new skills. She stopped to laugh, still in awe over the series’ success, calling the videos silly. Being in the right location is essential too, Sarah noted, who moved to LA to get her start. Like much of the gaming industry, voice acting is a pretty small world. A lot of studios look to people they’ve worked with before or to people within their circles. It’s a matter of getting heard and making your name stand out. 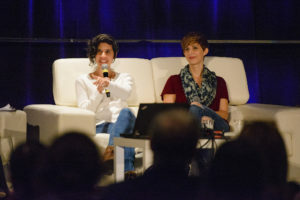 Ashly Burch (left) and Sarah Elmaleg (right). Photo By Danny Ngan. Ashly was always interested in writing, joking about her prior experience in fanfiction (I have yet to find her Final Fantasy comedies or Batman Beyond dramas that were referenced). 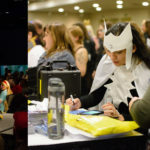 After Hey Ash boiled down a little, she landed a role as a Writing Consultant at Cartoon Network, where she spent a good chunk of time working on Adventure Time. 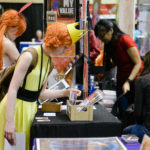 Adventure Time turned to female representation, says Ashly. As many of the topics focused on female-specific stories and ideologies, female writers were necessary, if not critical. She was specifically interested in writing character arcs. “There’s so little stories that are driven on character,” she said, “That’s what I want to do, what I want to focus on.” She wanted to see more empathy in writing, so that’s what she sought out for. Sarah nodded – even from an acting perspective, you have to find humanity and recognize the psyche of any character you play, and then play them earnestly (in Ashly’s case, writing such characters). They both rewatch their work to learn. “Compulsively! If they would have told me there would be guns…” she shrugged in reference to her work as Tiny Tina in Borderlands 2. Sarah writes video game opinions in her spare time, turning her experience in the field into a more intellectual stance on varying issues that we face in gaming on the day-to-day. She brought philosophy into the conversation: Humility. You have to be objective about your work. Creatives are far too often tied to work, when being objective is important for forward progression. Having the desire to improve is a big part of success. All of this, Sarah concluded, especially in male-centric fields, is why female support is vital to survival. 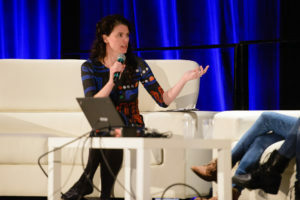 In a 2012 Kotaku post titled “As An Artist, I Hope Video Games Really Do Affect People,” Sarah did a miraculous job arguing that we should be better discussing our relationships with video games, and that artists should take responsibility for the reactions that their art invokes (on the topic of the common reception that games invoke violence, despite the absolute lack of scientific evidence of such a correlation). Not just through writing, Sarah wanted to get involved. That’s how she came about Games For Change, a group whose mission is to “catalyze social impact through digital games.” Sarah dedicates a great deal of her time off-screen working to utilize her art form in an impactful and progressive way. There’s so much character and wisdom between these two women. Even as a writer, who has no experience in voice acting, it was easy to feel inspired while each told bits of their story. 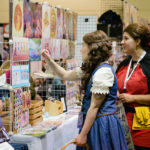 Regardless of creative discipline, both Sarah and Ashly had a knack for motivating, and even though we only spent a short while learning about their journeys thus far, we got a brilliant look at what a journey can be. From YouTube to scoring the leading role in the recent gaming hit Horizon Zero Dawn, and from amateur radio to leading intellectual conversations on social change in gaming, both Ashly and Sarah have traveled far, and have wonderful careers ahead of them.